Thanks to the mako's pop-out denticles, though, flow separation is greatly minimized along the length of its body. Working like the dimples on the surface of a golf ball, the protruding scales help prevent the formation of eddies, allowing the fish to move faster through the water. 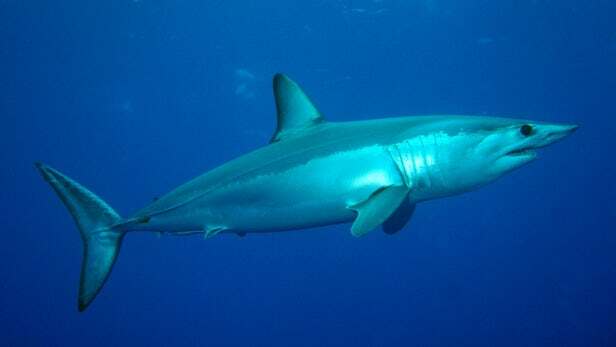 The beneficial effect was observed when the researchers placed samples of shortfin mako flank skin in a water-flow tunnel. "We set up an experiment in the tunnel with a measured amount of flow separation induced on a smooth surface. Then we replaced the smooth surface with shark skin and requantified the flow separation," says Lang. "In all cases with the flank skin, we saw the size of the separated flow region reduced significantly by the presence of the skin." It is now hoped that the research could lead to new materials for use on fixed-wing airplanes and the rotor blades of helicopters, making them more aerodynamic.